Tape or ribbon yarn has become a very popular yarn base, because it offers a sea of possibilities. Tape or ribbon yarn is very nice and easy to work with and makes for a very quick project as well. For this reason it is very suitable for the beginner who wants to take on larger scale project without having to invest too much time and proficiency to the project. 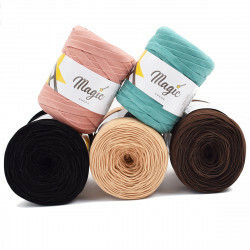 In our shop, you will find tape or ribbon yarns made of cotton and cotton mixed with polyamide, polyester, and viscose. 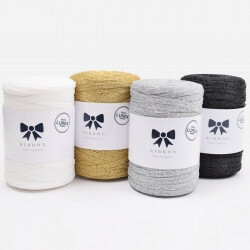 If you choose a tape or ribbon yarn made of 100% cotton, the end result will be soft and flexible, whereas if you choose a fibre blend, the end result will be more rigid. Tape or ribbon yarn is very well suited for home decor such as afghans, pillows, flower pots and baskets. Furthermore it is amazing for making glorious bags. No matter which type you choose, it is super practical - all tape or ribbon yarns are machine washable at 30 degrees and sometimes more. So there are great advantages and possibilities when using tape or ribbon yarn. All you need to do is figure out which one is best suited for your dream project. As mentioned above, tape or ribbon yarn is very well suited for a variety of knitting and crocheting projects. You can use it for home decor, bags, ipad/computer sleeves. Or use it for making glorious and HUGE amigurumi projects, to delight the little ones. Moreover, you can make lovely children’s blankets, that will amuse boys and girls alike. Tape or ribbon yarn has become extremely popular proportionally with the increasing popularity of making hand made interieur items for the home. At Hobbii, we carry a wide selection of shades, materials and weights of tape or ribbon yarn. All you need to do, is figure out which one is best suited for your next project. 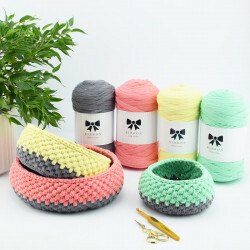 Here at Hobbii.com we want to be among the best and fastest in terms of delivery of textile yarn and yarn accessories. Which is why you will always receive your order within three working days of placing your order online. We take pride in our high level of customer services, and you are always welcome to give us a call, if you have any questions about any of our products. You always have the right to return any order placed at our webshop. Please do not hesitate to contact us, if you have questions regarding our textile yarn or if you need help placing an order. You can reach us by filling out the contact form, and we will get back to you as soon as possible. You call also call us at tel.no. +45 31 86 33 57 or email us at support@hobbii.com. We look forward to welcoming you as a customer in our shop. This is such an awesome product. I’ve been eyeing it for awhile and finally purchased. I’m planning on making a backpack purse with it! Can’t wait!! J'adore travailler avec ce fil. J'ai acheté plusieurs couleurs et elles sont toutes belles. I am in love with this product, so much so that I order in bulk and ship to Australia!! I have used the cotton to make bags, purses, iPad cases and baskets (large and small). The colour range is fantastic and amazing value for money. I will be back for more in no time. 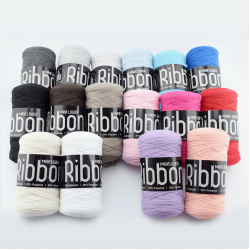 I use he cotton ribbon for crochet projects and would recommend a 7.00mm or 8.00mm hook. Thanks you Hobbii for providing wonderful service and products! Love thisit ribbon yarn. l made a doll moses basket which l fellin love with. lt is sturdy and l'm sure will provide hours of enjoyment for my great granddaughter. lt was impossible to find here in Maryland so l ordered it from Hobbi. lt took less time to arrive than an order from a company here in the states. l will definately be ordering more. This ribbon is really easy to work with. I wanted to create a basket like in the image of the ribbon, but found one strand was too flimsy. So i doubled up the great and black. 2 skeins managed to make a small laundry basket, big enough for my kids clothes. Very happy with the quality of the ribbon! I received this yarn in a timely manner and in perfect condition. Way more beautiful than I imagined it would be and works up nicely. Will definitely be ordering more very soon. First time I've ever used ribbon yarn. Very high quality. i love it and am going to enjoy making my tote. Just got started on it today and find it easy to work with.